Children protesting about climate change claimed they were threatened with £80 fines by a private enforcement firm. Pupils as young as Year 8 were allegedly told by an enforcement officer from Kingdom Services Group that their protest was "anti-social behaviour" and that they could be given tickets if they did not stop. The youngsters said the threat was removed once they made it clear their protest had been sanctioned. Other witnesses backed up the claims, but a Kingdom spokesman said "there couldn’t have been an intention" to issue the fine as the officer's body-worn camera had not been switched on. Kingdom is contracted by Peterborough City Council to tackle anti-social behaviour such as littering, spitting and cycling on Bridge Street. Its staff are allowed to hand out fines of £80, with the firm keeping £45 of the proceeds. Several councils have broken or not renewed their contracts with Kingdom, but the firm had its contract extended with Peterborough City Council a few months ago after an initial 18 month period. Young people were protesting about climate change across the country today, including in Cathedral Square where school and university students from Peterborough are calling for immediate environmental action both nationally and locally. One of the protesters, Olga, described being spoken to by the Kingdom officer. "He said we were presenting anti-social behaviour and that we should do it silently as people may be offended," she claimed. "We said we're not being racist, homophobic or discriminatory and that it is an approved protest, to which he kindly backed away." Other members of the group made similar claims. Green Party city councillor Julie Howell also witnessed the incident and claimed a lawyer walking past had told the enforcement officer his actions were unlawful. She said: "It was non-violent. They were standing with megaphones and doing a march around Cathedral Square. "He said what they are doing might be offensive. I said 'they are protecting the planet, it's offensive to stop them'. "He was threatening to fine them if they did not stop. They are children. "It was heavy handed and he misinterpreted the situation." A spokesperson for Peterborough City Council said: "We believe that on this occasion a misunderstanding between a group of young people and Kingdom enforcement officers occurred during a protest event. "The protest was quite loud and mistakenly perceived to be anti-social behaviour in breach of the Public Space Protection Order. Officers initially asked the group to stop before they realised what was happening. "We have since spoke to Kingdom about their handling of this incident and have reminded enforcement officers of their powers and responsibilities." A Kingdom spokesman said: "There couldn’t have been an intention to issue as the camera wasn’t switched on as per standard operating procedure." Despite the threat of being fined, the protesters, who were holding banners and chanting, said the overall reaction from the public had been largely positive. Hannah Hughes said: "Hopefully some people will come next month. We are going to do this every month until action is taken. "Locally we are trying to get Peterborough City Council to declare a climate emergency. Peterborough is supposed to be the environment capital of the UK but has not declared a climate emergency. Many cities have done that." Climate emergencies have previously been declared in Manchester, London and Edinburgh, as well as by many other councils, with authorities agreeing measures to try and become carbon neutral. Peterborough City Council's cabinet member for waste and street scene Cllr Marco Cereste said he agreed with the protesters' concerns, adding: "We as an authority take the environment very seriously and are looking at all areas to see what we can do and what we can afford to do." Cllr Cereste, who stated that he would be happy to meet the protesters, also outlined efforts the council is making on the environment. He added: "From now on anybody that's got more recycling than can go into a green bin, if they put that recycling in a clear, plastic bag the bin collectors will take it. That will make a bit of a difference. "We want to improve recycling rates quite dramatically and are looking at the best way to do that. The new recycling centre is a huge improvement on what we had before and that will make a difference. We're now putting together a business plan to look at changing the vehicles staff take to the depots and machinery to electric." 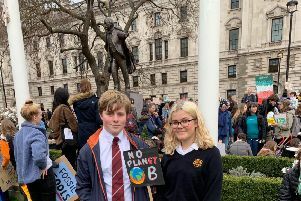 Among those to take part in today's protest, which was in the school holidays, were pupils from The King's School, Thomas Deacon Academy and Stamford Endowed Schools, as well as university students. According to The Guardian, more than 60 demonstrations involving tens of thousands of young people were expected today, from Parliament Square in London to sites in Leeds, Manchester and Brighton. This follows a similar protest on March 15 involving more than one million young people across the world, with many missing school to take part.